Batteries: Pye Type K4 (90v HT) & Pye Type K8 (1.5v LT). This set is described in sheet 789 of 'The Wireless and Electrical Trader' as "A post-war 'new Baby Q' " - although there is no indication of whether this was the magazine's description or the manufacturer's. The 'New Baby Q' is a battery only set using metallised valves. 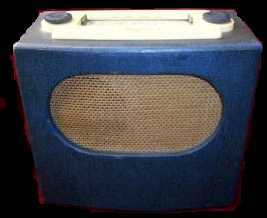 It is finished in a what I call 'Pye Blue' - a brightly coloured leather-effect material with a cloth grille. The layout is plain yet pleasing and a dash of colour in a drab post-war economy.